Advance your career with this new online community and resource exclusive to Wildcats. 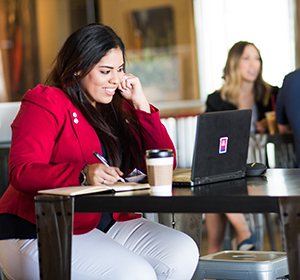 The Bear Down Network launched in April 2019 and continues to grow with UA alumni looking to mentor and hire Wildcats. Register on beardownnetwork.com to access an alumni job board and connect with alumni mentors and industry experts to help you make this next step in your career. Handshake is the free University of Arizona job platform for alumni to search for jobs and connect with employers. Currently, over 2,700 alumni have active accounts. If you graduated in the last year your account is already created. Just activate it! There are more than 2,600 jobs openings waiting for you! Handshake is a place where current students, alumni, career centers and employers come together to help job-seekers find jobs and employers find job-seekers. Create your own account and watch this video for more details. Alumni are welcome at career fairs hosted by UA Career Services in Tucson and Phoenix throughout the year. The Career Lab also partners with other universities for multi-school, alumni-only career fairs in cities in major metro areas across the country. Information on these and other career events is on the Alumni Association calendar. Wildcats@Work — Meet UA alumni with diverse career and life paths.